The Membership and Subscription Growth Podcast is now on iTunes, Google Play, and Stitcher! You’ll learn easy-to-implement shortcuts for fast membership and subscription growth. You’ll discover how to get more new members to join and what to deliver that improves membership retention and creates membership growth. 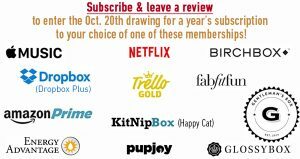 You’ll discover the best membership practices, proven retention strategies and unique insight into the membership and subscription economy from some of the most successful entrepreneurs in the subscription economy and membership economy, including specialized information publishers, associations, subscription boxes, digital subscriptions, SaaS, loyalty programs and more. My mission is to serve you with the most current and useful information available. Each of the episodes will include a summary on my blog page with a link to the podcast and the interview transcript. You’ll receive an abundance of valuable information! For a limited time, when you subscribe to this podcast and leave a review, your name will be entered in a prize drawing that will take place on Friday, October 20th! See the details below and click on the image to subscribe!